Sparring over the guarantees and limits of free speech seems to be growing rather than abating. How controversial? The advertising rejected by the Washington Metropolitan Area Transit Authority as being too political for public display. The most recent indication of just how much confusion there is on the topic of free speech comes in the form of a recently filed lawsuit brought by the American Civil Liberties Union against the Washington Metropolitan Area Transit Authority (WMATA) – a public agency popularly known as the DC Metro. The lawsuit claims that WMATA refused to display advertising from these organizations for fear of offending some of the people who use its transportation services. On the point of whether the advertising in question is “issues-oriented,” there is sharp disagreement. The Milo Worldwide ads featured a photo of Milo Yiannopoulos. The ACLU ad stated the First Amendment language verbatim. The ACLU suit contends that none of the advertising in question negates any kind of fundamental right to free speech. Moreover, the abortion pill provided by Carafem is FDA-approved as well as accepted by the American Medical Association. 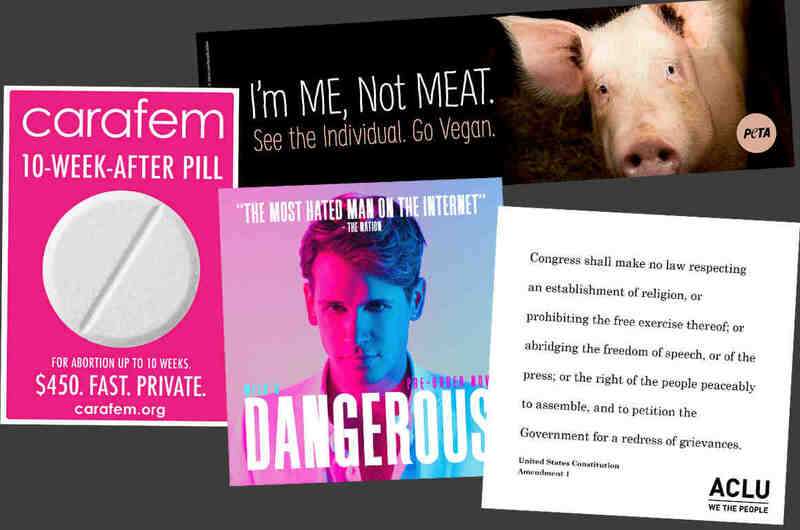 Even more problematic for the WMATA’s defense, at the same time the agency was rejecting the PETA ad, it approved one from Chipotle promoting a menu item made with pork. The only difference between them according to the ACLU? The Chipotle ad sends the message that it’s good to eat pork, whereas the PETA ad says the opposite. Looking at the contours of the lawsuit and the facts of the case, I think the WMATA defense is on pretty shaky ground, and for this reason, I’m pretty sure that the ACLU lawsuit is going to succeed. Indeed, it’s somewhat distressing that such a suit had to be filed at all, because its point is the First Amendment and what it’s all about: protecting everyone’s speech. That people are having to re-litigate the issue of free speech in 2017 speaks volumes about the level of confusion that has been introduced into the public sphere in decent years. ← Al-Jazeera axes the “Comments” section on its English-language website. A notable example is the Westboro Baptist Church members and their protests at the funerals of military personnel. Their message was repugnant, but they knew and obeyed the existing laws. They avoided the “captive audience” exception by keeping the legal distance from the funerals and not obstructing any access routes. Certainly, it was emotionally difficult to see them prevail in court, but it was important that a new “legal standard” was not applied to this group ex-post facto.